This irrevocable agreement was ratified sixteen working days after it was tabled. Two of the sections of the original draft, the ones on the financing of the Church and conscientious objection, provoked so much opposition that they were to be turned into later separate treaties. Thus the Basic Treaty provides the framework for four more concordats to follow. It was kept general to get it ratified by the wide-spectrum ruling coalition at the time. The Vatican waited a couple of years until two of the four parties in the new cabinet had the word “Christian” in their names before spelling out the details in later concordats. 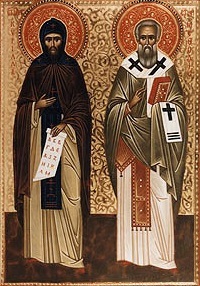 The preamble invokes the brothers, Saints Cyril and Methodius and Article 9.e below obliges the Slovaks to observe their feast day as a national holiday. It was these monks, who were brothers, who in the 9th century brought Christianity to the Slavs. They also devised an alphabet whose modified version, the Cyrillic, is named after St. Cyril and is still used for many Slavic languages. In 1980 John Paul II proclaimed these missionaries the patron saints of Europe. 3. The Holy See will ensure that the boundaries of dioceses and of apostolic administrative areas of the Slovak Roman Catholic Church, and also of deaneries and of exarchates of the Greek Catholic Church, will conform to the state boundaries of the Republic of Slovakia. 2. The Holy See will inform the Slovak government in confidence and prior to general publication, the name and surname of the person who will be nominated as Bishop, and also of the transfer, renunciation and removal of a Bishop. The confidentiality of the communication includes the duty on the part of the Republic of Slovakia not to express opinions about the person concerned and also not to take a stance on the decision of the Holy See. 1. The Above Parties will set out a special Accord concerning financial support for the Catholic Church. 2. The Catholic Church has the right to organize offertories in churches. The revenue accumulated from resources administered in this way is not subject to taxation or to the requirement of public accountability. Accordo base tra la Santa Sede e la Repubblica Slovacca. Translated from the Italian version by Dr.David Holohan.